Bringing the 80’s into 2018..
RJ Thompson is an artist that can look back on 2017 with some fond memories.. Touring with Jools Holland twice, a release of his debut album, and some significant critical support online. He’s not one to mine his words when it comes to socio-political issues either. Many of his tracks such as London and Echo Chamber (The album’s title track) have taken aim at Brexit & bigoted opinions in the U.K.
RJ doesn’t take anything for granted though, as an artist who’s had to graft for every great opportunity that’s come his way. He got his big breakthrough consistently playing grass-roots music venues, pubs, and clubs in his native North-East. It was a night in Hartlepool where the work paid off. A sound engineer at an open mic night was working with Live Aid organizer and Ultravox frontman Midge Ure. The engineer submitted RJ as a support act, leading to more than 30 shows touring the UK and Europe. Support shows with Gabrielle Aplin, Deacon Blue and Jools Holland (including a performance at the Royal Albert Hall) soon followed as well as several EPs and a live album. Now RJ is stepping out with his first solo, studio album. Echo Chamber is a total departure from his previous work. 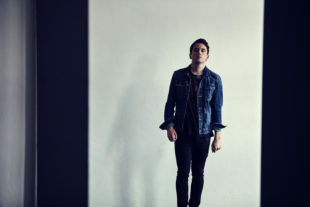 He’s swapped out the pop, acoustic male singer-songwriter gloss for a distinctive retro sound. Created with vintage drum machines, analog synthesizers and no small amount of funky guitar riffs. On the album, RJ explains..
It’s a bold and impressive display from the artists. There’s a consistent sonic theme throughout all the tracks, and nowhere is this more evident than in the melancholic and anthemic Skimming Stones.